Located just north of Flamingos Nayarit is Bucerias Mexico. The first thing to enchant you will be the simple charms of this traditional Mexican town. You’ll fall in love with the cobblestone streets, brightly colored homes (with enormous wooden doors), and the overall feeling of tranquility. The serene ocean, friendly people, and impressive sunsets that can be admired from resort hotels like Vista Vallarta and Royal Decameron Complex enhance the ambiance of Bucerias Mexico. 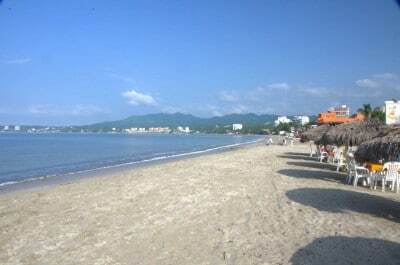 Bucerias is one of the most visited Nayarit destinations among national and international tourists alike. Visitors come in search of fun and relaxation in this pristine destination, known for its fine sandy beaches, tranquil surf, and colorful hotels and resorts. Bucerias Mexico is perfect for young children who enjoy floating over the gentle waves on inflatable toys. Here, adolescents love to sail, kayak, or jet ski in Banderas Bay and tourists of all ages delight in the wonders of the Pacific coast beach, as they rest under nearby thatched-roof huts. 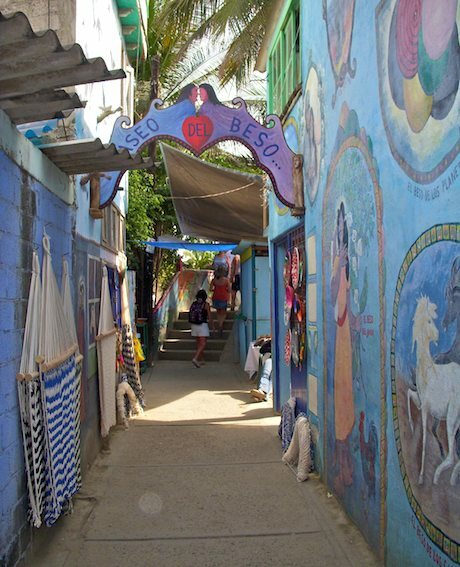 It is common to see people bicycling down the streets of Bucerías towards the beach, or walking through the communal market to do some Nayarit shopping for items such as silver jewelry, handicrafts, clothing, and traditional sweets. On the corners of the main streets of town are restaurants and bars with a decidedly tranquil ambiance, where you can relax while drinking a glass of lemonade or enjoying a delicious ceviche (lime-marinated seafood) tostada or shrimp cocktail. And, in the Main Plaza of Bucerias Mexico, you can observe the daily comings and goings of the locals as you enter the picturesque church or walk a few meters towards one of the safest Nayarit beaches in the region. This beach also happens to have recently been listed among the cleanest on the Mexican coast by the Secretary of the Environment and Natural Resources (Semarnat). In fact, Bucerias Mexico is so attractive that many visitors, especially foreigners, decide to establish their second home here in this enchanting Mexican west coast town. Surround yourself with the delightful smells, tastes and sounds as you are immersed in the living tradition of this time-honored small town on Mexico’s Pacific shoreline. “Books, culture, and music are companions that travel with you throughout this life; they will never leave you behind,” expresses Florelisa Hernández, director of Crearte, a cultural centre in Bucerias Nayarit. In its initial stage of development, the center was established in Bucerias Mexico to bring children and adolescents of the region, as well as adults, into the world of artistic creation in order to make a significant contribution to their growth and education. Crearte is a project that has just begun. “We offer classes to children and adults because I feel that art familiarizes you, stabilizes you. My project is mobile, so I work with different people both on an individual basis and through these centers,” explains Florelisa, a curator by profession. Since she was young, Florelisa has been familiar with different artistic expressions. Crearte has been active for several years now in the Regional Center for the Arts of the Riviera Nayarit (www.artenayarit.com) with oil painting, puppetry, drawing and paper mache workshops, among others, imparted in both English and Spanish. “Art saves. For me, it is a savior, and for a child with family problems, who is sad, it saves him. It means believing in creating an internal world that no one can take away. It is like music, when I see people carrying their guitar, they are never alone. It is the same with art and culture,” concludes Florelisa. Be sure to make reservations today and vacation in Bucerias Mexico in Riviera Nayarit!